Source: Wikipedia (Axel Hindemith). Flood marks on a building in Münden, a small town near the upper reaches of the river Weser. From bottom to top: Jan. 1995, Nov.1926, 1890-, Feb. 1909, Feb. 1946, May 1943, Jan. 1841, Jan. 1682, Jan. 1551, Jan. 1643, July 1342. Living near a river had its advantages. Transport was easy: you were well connected to other cities on (navigable) water ways, and trade was a reliable way to wealth. In the Middle Ages, the Hanze cities formed a powerful trading alliance, linked by water transport. If you also were on a land trading route and had a bridge, that was even better. A bridge gave you a monopoly on land transport, and you could raise a toll. Of course, if the neighbouring town also had a bridge, this reduced the income. But that was a solvable problem. Famously, Munich became a major city when, in 1158, the ruler burned down the competing bridge of the bishop in nearby Freising, a major hub on the salt route. Munich took over the trading route, and Freising never recovered. The bishop was unmovable and after all this time, the bishopry is still based in Freising, not Munich. Freising also lays claim to the oldest brewery continuously in operation, Weihenstephan, starting in 1040. (Actually their milk is better than their beer – longevity does not always imply quality). Germany values its traditions. A further advantage of the river was access to running water. The water powered the all-important water mills. You couldn’t bake bread without working mills to grind the grain, but they were also used for cutting wood, making the tools for the farmers, and many other types of manufacturing. Rivers boosted the economy in so many ways. Why would anyone want to live anywhere else? But there was also a disadvantage. You found yourself at the mercy of the river. If the water flow increased, the river rose and the town might find itself within rather than without the river. Many historical reports are on floods, and the damage they did to towns, their bridges and mills, causing death, famine, and economic depression. Living near a river was like walking on the San Andreas, or climbing Hekla. Life was good, but it could change suddenly and without warning. The winter of 1342, in the early phases of the Little Ice Age, had been cold and changeable. A rare earthquake hit the Netherlands in January. Eastern Europe had a cold winter, with much snow, and hard frosts in December and January; this was followed by very warm weather in late January which melted the masses of snow and ice. A second frost period came in mid February. In Western Europe, the hard frost only came in mid February, lasting until mid March. The melting snow caused rivers to rise, and the ice jams damaged many bridges. In January, Prague lost its famous Judith bridge to an ice jam. This was one of the oldest stone bridges in Europe, and the replacement (the Charles bridge) was not finished until after the year 1400. The Danube, Elbe and Seine all flooded in February. A storm flood hit Venice. After the winter, the spring was dry – so dry that in late May, the city of Mechelen caught fire (a common danger in the medieval towns, with wooden buildings, narrow streets and no water on tap) and was largely destroyed: thousands died. In other words, a normal year. But by mid July, the rains became biblical, kicking off the most dramatic river flood Germany has ever seen. On 19 July, rivers across central Germany suddenly began to rise, including in places which had had no rain. The next day, Saturday, the rise accelerated and soon the water entered cities, flooding streets and buildings. The floods came unexpected: winter floods were normal and happened most years, but summer floods were far less common. And the water kept rising, reaching levels no one had ever seen. People fled in panic; many died. Bridges, houses and towers collapsed. It took weeks for the waters to recede again. The damage was immense. Soil erosion became a major problem: in some areas one can still see the deep channels cut by the flow. This was the legendary St. Mary Magdalene flood. Almost 700 years later, Germany has still not seen its like. It was a true millennium flood. Germany is a land of many rivers. In the north, the Rhine, Weser and Elbe flow to the North Sea. In the south, the Danube (Donau) and its many tributaries flow east, towards the Black Sea. It had started with rain. On Sunday 21 July, the bishop of Wurzburg wrote “Also the underground reservoirs were broken and the floodgates of heaven opened and it rained on the earth as in the days of Noah [..] The [river] Main destroyed all the bridges and caused even the city walls to collapse.” This description mentions the biblical rain. Not all reports do: in some areas the floods came without much rain. That must have been even more terrifying. 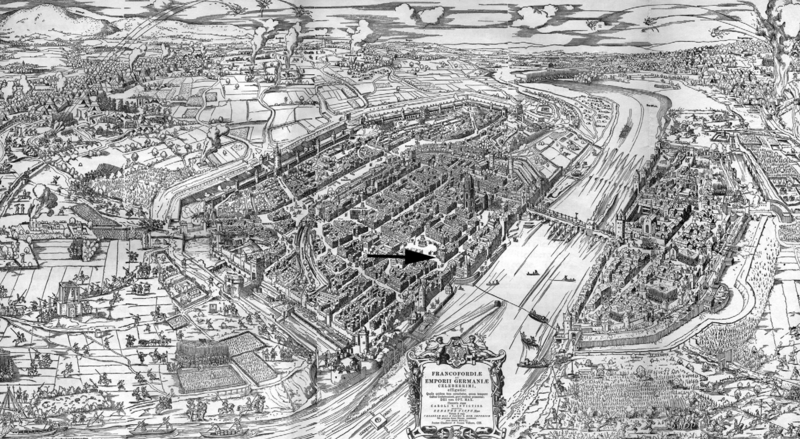 Frankfurt was the first to suffer the river deluge. The city lies along the river Main, the second-largest tributary of the Rhine. The rising river quickly overcame the defences, and flooded the town to 500 meters outside its bed. The flood levels have been recorded with plaques in buildings, and these show good consistency: the flood peaked at some 7.8 meter above normal, on 20 or 21 July. The Nikolai Church was 1.5 meter deep in water. On the opposite side of the river, in Sachsenhausen the flood caused a hole in the main street 30 meter long and 6 meter deep. The old stone bridge over the Main, called the old bridge which was the pride of Frankfurt, collapsed on the 24th of July. There were no other bridges in the surrounding area. In Wurzburg, the floods came suddenly, on Sunday morning. Within hours the part of the city facing the river was under water. The flood reached the cathedral. The peak level is not as well known as in Frankfurt, but is estimated at 10.3 meter above normal. The beautiful stone bridge collapsed, as did all other bridges and mills. Parts of the city wall and some adjacent stone houses collapsed too. Cities downstream along the Rhine were badly hit. Mainz and Cologne were under water. The river Weser flooded, with cities such as Kassel and Hannover in deep trouble. Meiningen completely flooded within a single night and many people drowned. Further east, Halle and Erfurt were badly hit. Many of these towns lost their bridges. Along the Danube, Regensburg flooded. But there were few reports of problems further upstream or downstream on the Danube. France seems to have avoided the floods, apart from Avignon, on the Rhone, where there were reports of local heavy rains. The Netherlands suffered from the high water along the rivers, and on 25 July many river dikes broke. Prague had already lost its bridge to the ice in February. In the July flood, bridges at Regensburg, Bamberg, Erfurt, Wurzburg, Frankfurt and Mainz, and probably many others, were destroyed. These bridges were major constructions. Don’t imagine narrow, wobbly crossings. These were the highways of their days, and doubled as a border crossing. They were stone-build, large enough to have buildings or even houses on them, often a chapel, and in one case the town hall. A mill might be built into the support pillars. Large gates guarded the access to the bridge on both ends. The pillars were designed such that in the upstream direction they could act as an icebreaker. The bridge in Mainz was typical: it had 15 pillars, of which only 6 survived the flood. The scale of the damage becomes understandable from the sheer height of the flood. In Mainz, the water reached higher than anyone had ever seen before. Cities were deep under water for days. 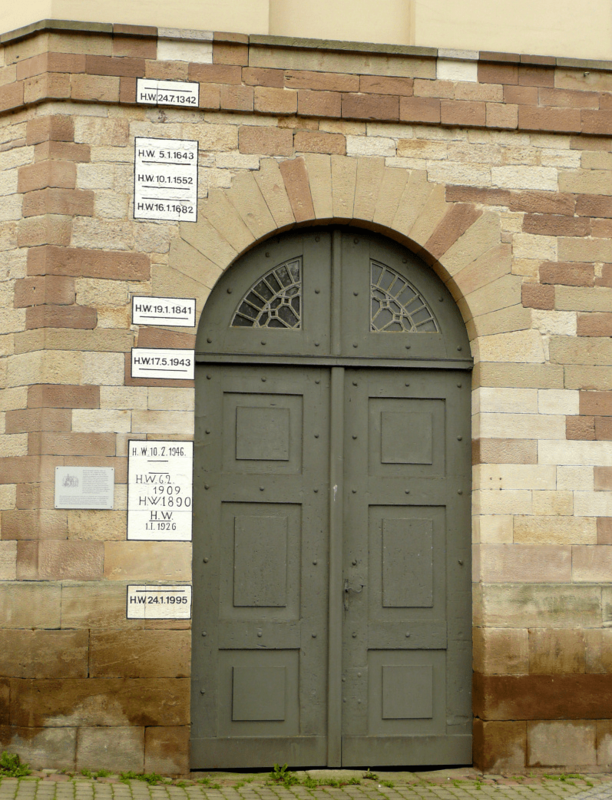 The picture at the top of the post shows flood marks on a building along the Weser, each recording a different flood. There, 1342 was the highest one recorded. The same is believed to be the case in Frankfurt and Wurzburg: in the almost 700 years since, the flood levels have not been equalled. The flood travelled faster than the warnings. In those days, information travelled at the speed of one man on a horse, and this was limited to about 60 kilometer per day. The mass of water came down the river faster than that. (A modern problem: streaming is fast, information is slow.) Downstream, people had little or no warning. Especially further north, where it had not rained, the devastating flood came as a complete surprise, and the reports mention that the people did not understand where all the water had come from. Floods are caused by water. Most floods occur in winter, and are caused by snow melt. Summer floods are rarer, and always come from excessive rain. The amount of rain exceeds what the ground can absorb, and the run-off comes in fast. In this way, a single thunderstorm can cause a local flash flood. But clearly, what happened here is rather more than one flash flood. The locations and dates of the floods gives a strong indication where the rain had fallen. The core region was near Frankfurt, affecting the river Main. There was no flooding further south – in particular, the Neckar, south of Frankfurt, did not flood, and the Danube only flooded at Regensburg and not further up-stream. Most other flooding was along rivers which originate north of the Main, in the same general area. The map above shows the mountain ranges in Germany. From the lack of flooding in the south we can rule out the Alps, the Swabian mountains and the Black Forest. Regensburg, on the Danube did flood, but the city is just downstream from where the Altmühl river joins the Danube: the Altmühl’s source is near the eastern stretches of the Main. The Weser also comes from this area, a little further north. 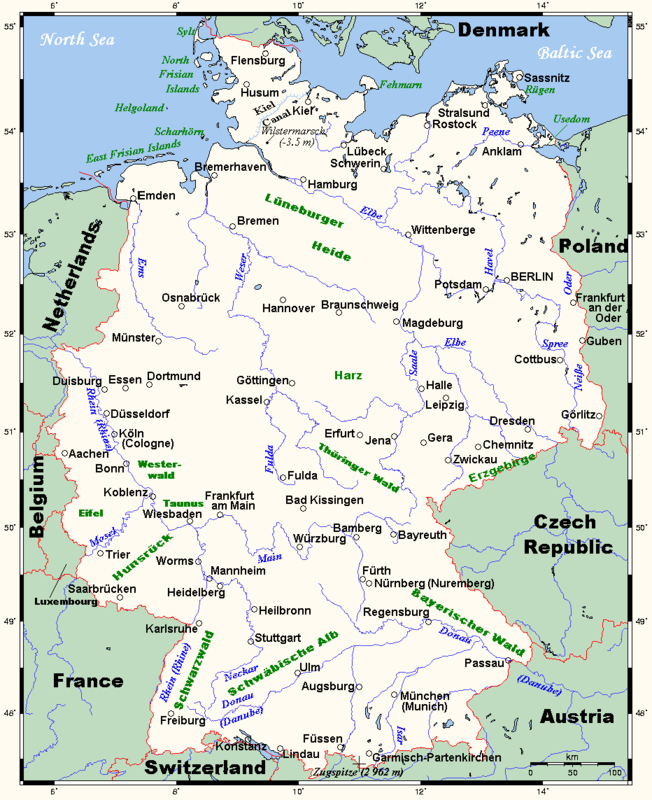 Erfurt and Halle get their rivers from the Thuringer Wald, so the rain must have extended there. Thus, the trouble came from a region stretching between Frankfurt and the Thuringer Wald. This is part of the German ‘Mittelgebirge’, the upland region which crosses Germany west to east, from the Eifel to the Ore mountains (Erzgebirge) on the Czech border. The mountains here are not high, typically 500-800 meter. It is the memory of an ancient mountain belt running from Cornwall to Eastern Europe, an eroded scar from a continental collision 350 million years ago. The scar is the source of much of Europe’s mineral wealth, from the tin mines of Cornwall to the silver of Joachimsthal (thal means valley) in the Czech Republic. 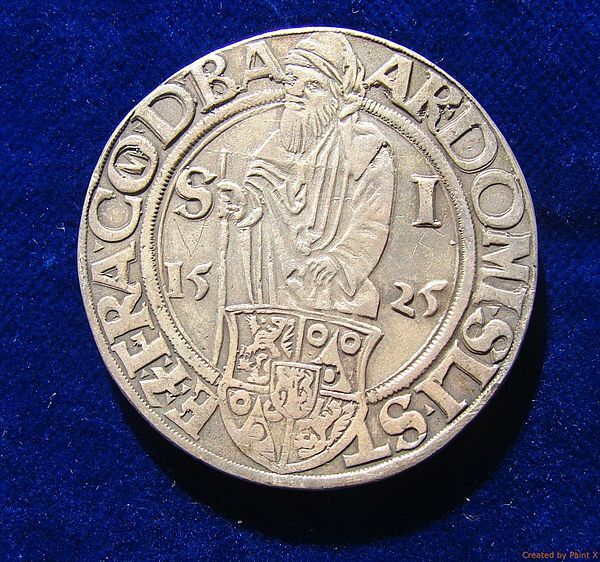 In the Middle Ages, the silver mined in Joachimsthal was used for minting coins. ‘Thaler’ became synonymous with money. While many words for coins were ultimately nationalistic (‘florin’, ‘franc’ and ‘euro’ come to mind), ‘thaler’ became international. It survives to this day in the word ‘dollar’. There is money to be made from geology: this ancient continental collision is still paying our bills. In the list of flooded and damaged cities, Dresden is the odd one out. It lies in a different water flow region, getting its water from the Ore Mountains via the Elbe where there were few other reports of flooding. Medieval reports are not always reliable. They are often second-hand, written down a long time after, and can be less than rigorous in their fact checking. The closest modern analogy would be the tweet. Those reports tweeted that Dresden had lost two of its bridges completely, whilst the third, the Augustus bridge, a wooden bridge with stone foundations, was so badly damaged that it could not withstand the winter ice and collapsed in March 1343. But the main damage may have come from the previous winter which had affected this region badly. Another example of inaccurate reporting is the story that in Cologne, on the Rhine side, rowing boats could cross over the city walls. That did indeed happen, but not in 1342. This was in the winter of 1374 when the Rhine rose even higher. Frankfurt flooded a day before Wurzburg, even though the latter is upstream. This suggests the rains started in between the two cities. This points at the hills of Spessart and the Vogelsberg. Spessart is a region of hills, reaching to just under 600 meter high, stretching north from the Main. The area is covered in forests of ancient oak and beech trees. In the Middle Ages, much of this was hunting preserve, and sparsely populated. Germany loves its forests; they are an indispensable part of the culture. So many of their ancient children’s stories involve forests. Life in the forests is hard: in the stories, wood cutters are invariably poor, and many of the people who live there are dangerous and to be avoided. Hansel and Gretel is the archetypal description of the medieval forest. 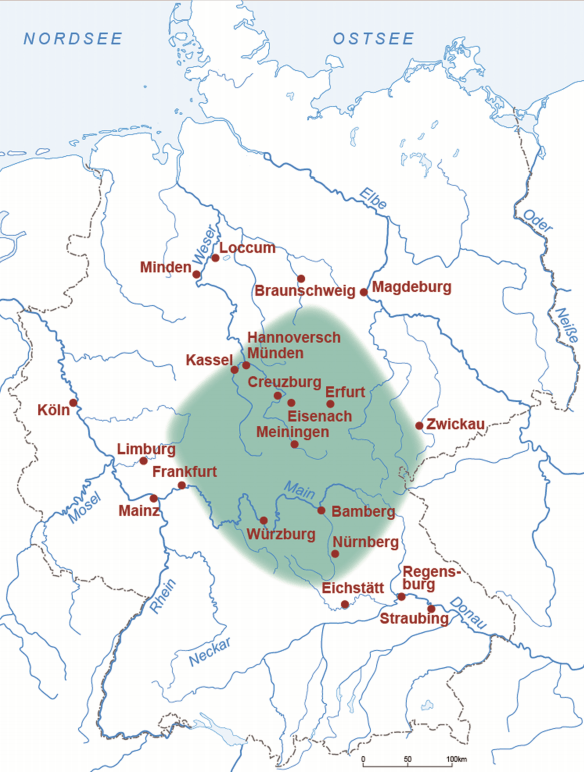 The Spessart area fits all the requirements for the source region of the St Mary Magdalene flood: in between the cities of Frankfurt and Wurzburg, close to the river Main allowing the water to reach the river fast, and avoiding the area further to south. 60 kilometer northeast of Frankfurt, just north of the Spessart, is the Vogelsberg, another region very likely involved with the flood. It is an area with fascinating geology. Don’t expect spectacular mountains: the hills are beautiful, very green, but not high; the core is a 770 meter tall plateau. But the geology is worth it. The Vogelsberg covers 2500 km2, as such, this is the largest single volcanic area in continental Europe. The plateau is a combination of different eruption sites with overlapping lava flows. It decreases stepwise in height towards the edges. To all appearances it is a shield volcano, but that isn’t quite what it is. The German Traps might be a better name but it was not a hot spot volcano. The pseudo shield was build by effusive, basaltic eruptions and pyroclastic flows. The Vogelsberg was formed in episodes from 18 to 10 million years ago. The activity peaked about 16 million years ago. There are other volcanic areas nearby, where the activity started a bit earlier (22 million years) and lasted a bit longer, but the region went extinct 7 million years ago. The ultimate cause was a graben formed by crustal extension, perhaps due to the building of the Alps. But this is all in the past. The graben is no longer active and the volcanoes have died, leaving only the hills. But they can still reach for the sky and catch the rain. The height of the water during the flood can be used to estimate the flow rate of the river. For the river Main, the level of close to 8 meters at Frankfurt yields a flow rate of 4000 m3/s. For comparison, the average value for July is 100 m3/s, and the highest recorded value measured by a gauge over the past 100 years is 2400 m3/s. The flow rate of 1342 is expected once in 4,000 to 10,000 year. It was a rare event. The source region of the Main has a total area of 21,000 km2. Modelling has shown that the flow rate of 4000 m3/s requires an average rainfall over this entire region of 175-215 mm. If the area of peak rain was smaller, as is probable, the peak rainfall must have been higher: perhaps up to 300 mm is a reasonable estimate. The duration of the floods in different places, 19-25 July, suggest that the rain fell over 3-4 days, possibly moving slowly east during this time. For this region, it was the mother of all extreme weather events. The flooding may have been worsened by deforestation. Wood was the main source of fuel for the fast growing population, and it was harvested faster than it could re-grow. This was the background of the wood cutters of the medieval stories. Around 1300, many regions in Europe tried to protect their forests by banning the cutting of trees but this was unenforceable. And the forests went fast: by 1300 France had less forest than it does now. Wood became scarce, the price increased, and the first fuel crisis was the logical consequence. Many of the boats along the rivers carried wood for consumption downriver. A monk in the Elzas complained that the deforestation meant that the tree roots couldn’t keep hold of the water, and the rivers were becoming larger and faster. That scientifically accurate observation was around 1300! Several papers speculate about what kind of weather system could have caused the catastrophic rain. In recent years, the heaviest rains on record in Germany have come from a so-called ‘Genua low’ or ‘Zugstrasse Vb’: a low pressure region in northern Italy channels humid, warm air around the Alps, northeast-ward. But this causes heavy rain in southern Germany, while in fact there are no reports of heavy rain or of flooding there in 1342. Although still oft-mentioned, the ‘Zugstrasse’ seems unlikely. Another option is a stationary cut-off low, giving convective rain in the uplands, caused by a very unstable atmosphere. In recent times, such a situation has on occasion caused rain amounts in excess of 100 mm in this region, but only in August, not July. A cut-off low is a cold-core system which develops out of a cold front. They can form with a blocking high pressure system further north, in which case they can be very slow moving. This may be the most likely cause: the heavy rain and wind over England in the previous week could be due to the main low from which the cut-off low spun off, while the dry weather over northern Germany is consistent with a blocking high. Below is the movie of how the (not so slow moving!) cut-off low on the image above developed. It moved, but without going anywhere. 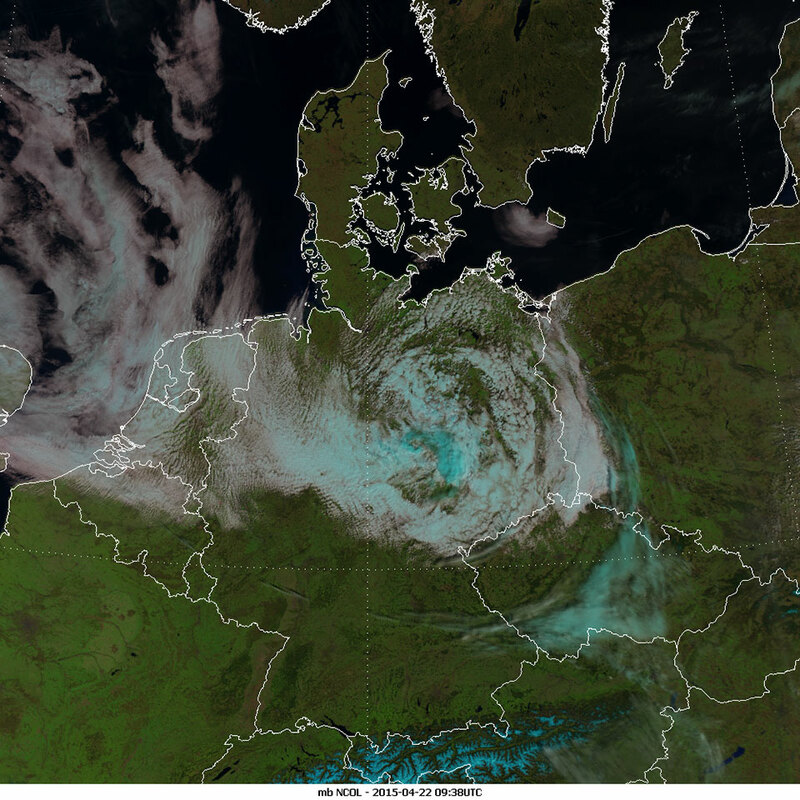 Yet another possibility is that a remnant hurricane found its way to central Europe, and came to a stand-still there. We have no similar modern event to compare this with, but an errant hurricane did dump 300 mm of rain a few years ago in the English Lake District, causing widespread damage. It is unclear whether the weather had been dry or wet in the days before the catastrophe. Some of the reports of the flooding mention that water seemed to come up from the ground. That suggests that the ground was already saturated from previous rain. In spite of the extreme nature of the event, the same modelling indicates that this may not even be the largest flood possible in this region. Rain amounts of 200-300 mm over the entire area are in principle possible. In this way, the Vogelsberg, the old volcano, could still attack Frankfurt, the location of the European Central Bank and the heartland of the Euro. What money the earth gives, it can also take away. The emergence of the cities from the flood must have been slow. We have no reports from after July 25, but it is inconceivable that all flooding had ceased by that date. Modelling suggests that the Main would have needed four weeks to retreat back into its summer bed. After the flood, Frankfurt began to have an annual procession on St. Mary Magdalene day (July 25), unique in Europe. But this was the least of the consequences. The loss of so many bridges, instantaneously, was devastating. Bridges were essential to the economy, and very expensive to replace. The Main bridge in Frankfurt was the only one in a wide area (perhaps not entirely accidental: see Freising above). Large regions were now poorly connected, with a lack of transport, and this would also reduce the income of the cities from the tolls. Replacing the bridges was high priority but would take years. The damage to so much agricultural land was equally bad. The amount of erosion from that single year has been calculated as 17 times the average annual erosion. Even during the extremely wet years around 1315, erosion had been only 5 times the average. Difficulties in moving the produce would not have helped. Much agricultural land was abandoned; it took a long time to recover. But Europe never got the time it needed. The bridge at Frankfurt was rebuild in 5 years. But the climate had been deteriorating, as this was the early years of the Little Ice age. Around 1342, the advancing sea ice caused the traditional sea route between Iceland and Greenland, at 65 degree latitude, to be abandoned. Later ships followed a more southerly route. 1345 and the following years were cool and very wet. In 1347, Germany had snow in September. Iceland had a string of extreme winters from 1348 to 1351; in 1348 sea ice enveloped the country. The extreme weather was not entirely climatic. There had been a major volcanic eruption, in 1345, which left its trace in the Greenland ice core record. The poor weather seems likely related to this. The next problem started around the Crimea, where the wet weather of 1345 drove rats from the fields into towns, searching for food. They carried a dreadful disease with them. In 1346, the first reports of the black death reached Europe. The following year the epidemic arrived in earnest. Florence was decimated in 1348; even the dogs succumbed. By 1349, the epidemic had spread across Europe. The population of Europe would not recover for another century. To the survivors, the string of ever worsening disasters must have seemed like the end of the world. Why discuss an extreme weather event in a volcano blog? In part, just because I was curious. But there is a lesson here. While a single disaster is manageable, several disasters in quick succession are much harder to deal with. In the 1340’s there were three such events: the Magdalene flood, the unknown volcanic eruption, and the black death. The combination was worse than the sum of its parts. Medieval Europe was pushed over the edge. The flood had affected only a part of Europe, and although it was economically devastating, the area could recover. Having the volcanic eruption affecting the weather during the recovery was bad luck. It is not unlikely the volcanic weather contributed to the emergence of the black death. Disasters rarely happen in isolation. The worst climate event of the last 2000 years, around 540 AD, was due to not one, but two major (VEI7?) volcanoes in succession. Be prepared. out in my (budded) rose garden. Due to a cold core cutoff stalling over Idaho and Montana..We in NE Oregon had a nice ,warmish November. Today cloudless blue sky and 30°C…in the Rhine graben. Albert: I wished my history teacher could have told storys like you do! We had a lot of flash floods last year in june and july, if I remember correctly often something like 60-100L/sqm in 2 to 5 hours. But as it were regional events, there were small towns severly hit, but no major flooding along the complete river. The cause were almost stationary thunderstorms. ..oh, and the skeeters are fierce! 32+C here in Florida. You either sweat, or you have heatstroke. Tough choice eh? Stay hydrated and you can last longer. AC is the better option. It gives you a place to escape the heat. The afternoon pop up storms should be starting any day now. Bogoslof erupted again, and Sheveluch has been prolifically producing ash this week, a couple of brief red alerts. Apart from that things seem to be really quiet at the moment..
Quiet? You haven’t been watching Sakurajima enough. Semi-constant low-level ashy activity punctuated by larger blasts yesterday. Definitely seems to be back in business; this all started a couple of weeks ago after almost a year with virtually no activity. Mike, do you have a good webcam to watch? I’ve noticed the old opentopia webcam link I’ve used in the past seems to be constantly zoomed in super close to the volcano, making it tough to really tell what is going on. To the right of the map you’ll see five blue menu buttons. You want the bottom one. The 12th and 13th from the top down are Sakurajima. The 536 event started with one (or even two) VEI7 eruptions (Krakatoa is possibly one of the culprits). A severe climate disruption followed and then a black-plague, called Justinian plague around 541. But the dark ages were already established at this time, after the fall of Rome in 476 (possibly due to the already cooling climate). A similar severe climate disruption occurred in 1314, with a great famine across Europe, the largest in 1000 years (around the year 1317). But so far no volcano culprit has been found, and neither a signal in the ice cores. Heavy rains and a lack of summer occurred in 1314. First in 1337, the Hundred Years War started, between France and England. This complicated things across Europe. Second, a market crash occurred in some of the thriving Florentine markets in north of Italy. Across Europe, there was a wide economic depression. This started in 1341. But more wars occurred around 1340. A civil war started in the Bizantine empire, and wars started both in Sweden and in Spain. Other than this, there was some sieges by the Mongols. The black plague (1345) was helped by all of this. I am not sure whether the “Rekjanes fires of 1340” (the 5 volcanoes in the space of a year) contributed to any climatic disruption. But the climate suffered around this time. Wolf minimum in sunspots contributed to the increasing little ice age. Even when you see things worldwide, it is clear that a decline and crisis were not just centered in Europe. The Mississippian culture declined in this decade, as well as the Yuan dinastry in China, which suffered from floods, food disruption and great social unrest. Albert: by the way, I enjoy your theory that this was an episode of rifting fires, with the several adjacent fissures opening. Yes, there was a lot going on around the 1340’s! Iceland had a very snowy winter in 1341, but whether this had anything to do with the volcanoes is open for discussions. The solar minimum cannot be to blame: I have studied this and came to the conclusion that there is no relation between climate and sunspots. But the climate was cooling at the time. The big eruption was not until 1345. Around 540, there were two major eruptions, but Krakatoa is in the clear, I think. There is one story going around that it had a major eruption at that time but it seems made up. The area around Krakatoa have shown no sign of such an eruption. Llopongo is a plausible candidate for one of the two. Fantastic read, thank you. These are my favourite type! Another interesting example of weather related problems were the Nordic years of 1867–1869. The cold winds from the north got stuck pushing down cool air during almost the entire winters and springs. Summer was one to two months late during these years and the fall came early. Not much food was produced. These winters were one of the major reasons for the huge migration of Swedes to the United States. People were starving in Sweden and Finland at least. This combined this with an additional catastrophy could’ve led to much worse results. The interesting thing here as well is that we haven’t had much of these types of catastrophies during the last 100+ years, which makes us very unprepared for the things that will come. 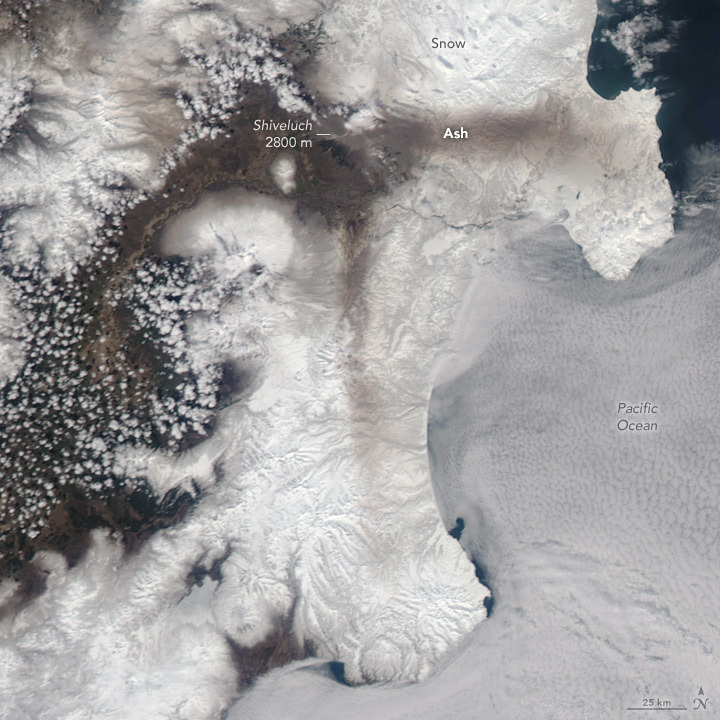 Even a relatively small eruption on Iceland impacted the entire world, but there are so many other things that may happen. That whole mass exodus thing has always baffled me. Sure, I can see tge need to flee horrendous winters… but to Minisota? The concluding paragraph of this excellent article reminds me of the 1952 story Year of the Jackpot http://www.weylmann.com/The_Year_of_the_Jackpot.pdf which made a great impression on me as child. I keep getting the impression that there is a whole suite of cyclical phenomena, including volcanism which is the focus of this site, which were on the whole favorable to human growth in the last half of the twentieth century and are starting to head into a trough simultaneously. The mid sixth century and mid 14th century are excellent historical examples of such a perfect storm scenario. As a child I used to have nightmares about tsunamis and volcanic eruptions and was told solemnly by knowledgeable adults that these fears were groundless – that the beaches where I played in the summer were not vulnerable to tsunamis and that any volcanoes capable of threatening Eugene Oregon were unquestionably dead. Err… you may have been lied to… or at least misled. However, the liklihood of such an event is quite small. Until it happens. The Lake District is an ancient caldera supervolcano, just like Glen Coe in Scotland. I would like to see an article here about these two old supervolcanoes. Yep, it was my fault! Posted an article before it was ready and had to pull it. Thank you Albert, this is a fascinating article. I’m not just a volcanoholic, but a meteorological buff and a history enthusiast as well. You’ve managed to combine all of these into one post! So I really enjoyed this, and learnt of an incident of which I knew nothing until now. Thanks! Hawaii is having a tantrum. Earthquakes everywhere, from Mauna Loa caldera to the southern cliffs of the big island. Must be that fancy new website – the island is trying it out. Speaking of failed eruptions – Piton de la Fournaise even opened up an fissure last night, but only gas ‘erupted’, as the magma got stuck.. Must had been pretty close! Probably it will continue in the days to come..
Bogoslof had quite a big bang this week, with ash to 10 km. This image is from before that explosion. The lake is supposedly warm. There may be something under it. Too many cockles spoil the broth. That actually sounds like a good idea, might try that next time if I remember it. Long time ‘lurker’ on this fabulous site! Just noticed how many clips from the film ‘Koyaanisqatsi’ on this vid. 3 new stars inside Bardy….. Anything going on there atm? And there the 4th star came…..
Update on that last star…..
That was an exciting four-star night! The third star may need confirmation. It was very shallow and outside of the caldera, and doesn’t have the usual 99% confidence. After a few months of stability, Mauna Loa may have resumed its inflation. Always dangerous to read too much into few data points, but there is a hint. And there is a LOT of activity near Lo’ihi. Pre-eruptive or undersea landslides? Something for everyone interested in volcanoes that are young at heart!